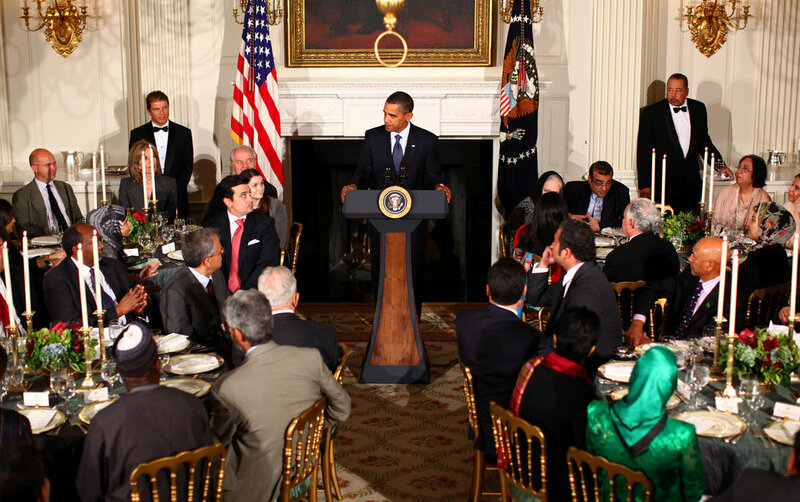 In this Muslim season of Ramadan, one of the social myths promulgated by former President Obama and gladly trumpeted by the mainstream media as fact is that the White House has had a long tradition of celebrating iftar (a meal that breaks the Ramadan fast at the end of each day of that lunar month) with Muslim guests. How long does that tradition reach back? All the way to the presidency of Thomas Jefferson in 1805! So goes the myth. Even the New York Times has carried water for this fairytale in an attempt to show how tolerant or even approving our founding fathers and most presidents since then have been toward Islam. In hosting the iftar, Mr. Obama was following a White House tradition that, while sporadic, dates to Thomas Jefferson, who held a sunset dinner for the first Muslim ambassador to the United States. President George W. Bush hosted iftars annually. Perhaps Stolberg is to be excused for swallowing the President’s message hook, line and sinker that evening as he spoke of Jefferson’s trailblazing dinner as “the first known iftar at the White House,” in honor of “the first Muslim ambassador to the United States.” Yet, even if Mr. Obama was willing to play fast and loose with the truth, a journalist should have higher standards. It was written in their Koran, that all nations which had not acknowledged the Prophet were sinners, whom it was the right and duty of the faithful to plunder and enslave; and that every mussulman [Muslim] who was slain in this warfare was sure to go to paradise. Since at that time the U.S. Navy was still in its infancy, Congress bowed to the Barbary demands for tribute money in order to ensure the safety of American vessels in the Mediterranean. But Jefferson was not happy with this state of affairs. Upon becoming President in 1801, he decided it was time to end the forced tribute payments. When he rejected the tribute demands of the Pasha of Tripoli, the latter declared war on the USA on May 10, 1801. Four years and one month later, the First Barbary War would end with a treaty signed June 10, 1805. However, naval forays still occurred on both sides, and later that year, the Tunisian Pasha decided to send an envoy to Washington to negotiate favorable terms of restitution for losses and continued tribute. 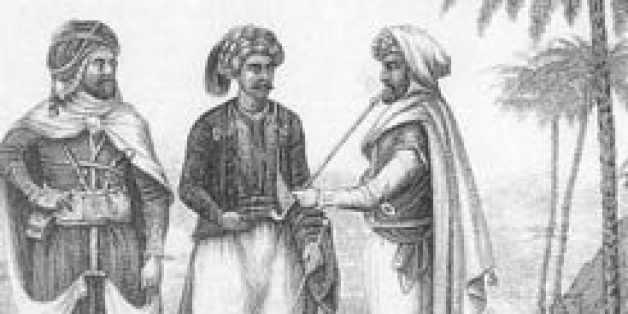 The envoy, Sidi Soliman Mellimelli, together with his entourage, arrived on November 30, 1805. This is the basis upon which Mr. Obama staked his preposterous claim that “the first known iftar at the White House” was hosted by Thomas Jefferson. There is no evidence in any records of the time that Jefferson was taking any note of the religious holiday in question, nor asking his guests to celebrate it with the Muslim envoy; rather, this was merely an instance of courtesy extended to Mellimelli to enable him to accept the White House invitation. Journalist Stolberg was apparently aware enough of Obama’s sleight of hand that she could not bring herself to call the dinner an iftar celebration directly — she refers to it as a “sunset dinner” — but nonetheless she creates a strong innuendo for the unsuspecting reader to conclude that it must have been an iftar held to honor the “first Muslim ambassador.” Another correction: in point of fact, Mellimelli was not sent as an ambassador from Tripoli but as a temporary envoy, whose stay in Washington lasted about six months. Even more deceptive, however, is Stolberg’s glib assertion that the 2010 iftar hosted by Mr. Obama continues a long, if sporadic, White House tradition, which of course if true would support the former president’s claim that Islam has always been part of American history. We have already seen, however, that Thomas Jefferson did not host a Ramadan dinner back in 1805. So who was the first president to kick off the long tradition of honoring Muslims by helping them break their fast with a meal at America’s House? Was it James Madison in 1816? No. How about John Quincy Adams in 1828? Hardly. Perhaps James Buchanan in 1860 just prior to the Civil War? Nope. William McKinley at the turn of the 20th Century? Struck out again. Woodrow Wilson? FDR? Richard Nixon? Jimmy Carter? Ronald Reagan? Bill Clinton? No, no, no, no, no, no. The long, if sporadic White House tradition turns out to be anything but long and sporadic. 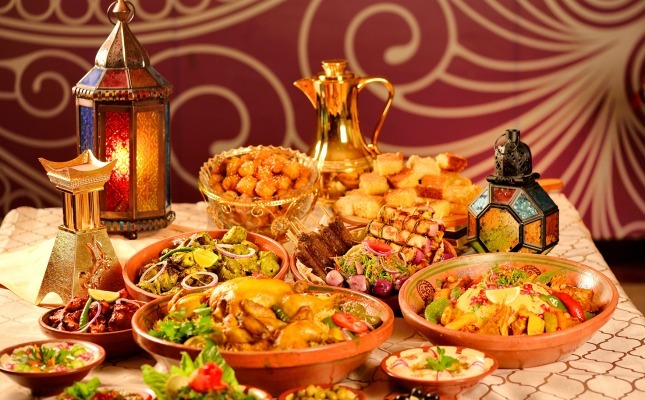 The first White House iftar celebration took place during George H. W. Bush’s administration on Nov. 19th, 2001. Desperate to project the image that the USA was not at war with Islam as a whole while yet undertaking a bombing campaign against the Taliban and al-Qaeda in Afghanistan, Mr. Bush sought to cozy up with Muslim dignitaries and luminaries by showing iftar solidarity with them. He continued this new practice throughout his administration, and Mr. Obama continued it throughout his eight years as well. The “tradition” was thus sixteen years old, when President Trump came into office and decided last year not to continue the practice, at least for 2017. There are some fresh murmurs among the political elite that he may give in to pressure this month and “throw an iftar celebration” at the White House just to prove that he has no animus against Islam after all. This is all true. Muslims believe that by this month of discipline and piety they are training themselves to be more obedient slaves of Allah, and they are hoping for his favor. Their religion tells them that every act of piety earns at least double rewards from Allah when done in this “blessed month.” So by fasting every day, reading the Qur’an more faithfully, giving alms more generously, reciting extra prayers in the evening, they are racking up salvation points that will counteract the demerits of their sins. Of course, that’s not surprising — every legalistic approach to God has to come up with a system of do’s and don’ts and a scale to weigh one’s progress or recidivism. But what Muslims don’t tell the rest of the world is that their Ramadan charity is almost exclusively limited to Muslim recipients. The zakat (mandatory giving) they fork over is in some measure applied compassionately to the poor and the needy (among Muslims, that is); but part of that almsgiving is also sent to support jihadis engaged in extending the conquest of Islam over the world, as well as the building of mosques, printing of Qur’ans and so on. Almsgiving does not always mean almsgiving; sometimes it means supporting the war effort. A man came to Allah’s Messenger and said, “Instruct me as to such a deed as equals Jihad (in reward).” He replied, “I do not find such a deed.” Then he [i.e., Muhammad] added, “Can you, while the Muslim fighter is in the battle-field, enter your mosque to perform prayers without cease and fast and never break your fast?” The man said, “But who can do that?” Abu- Huraira added, “The Mujahid (i.e. Muslim fighter) is rewarded even for the footsteps of his horse while it wanders about (for grazing) tied in a long rope.” (Sahih Bukhari, Vol. 4, Book 52, Hadith 44). If jihad is the best of all deeds (or even if it only ranks in the top 10), then during Ramadan when its already tantalizing rewards are multiplied by 10 or 70 or 700 (depending on which scholar you read) the impulse to engage in jihad grows exponentially. It’s no surprise that more violence and killing occurs during Ramadan than during any other month of the Islamic calendar. Mr. Trump’s Ramadan greetings somehow failed to mention this. In case you doubt this take on Ramadan, try googling “Ramadan and jihad”, and you’ll swiftly discover what traditional Sunni scholars are thrilled to share: that most of Islam’s great military victories, whether under Muhammad’s leadership or after his demise, have taken place in this “blessed month.” Ramadan is the month in which Allah sends his angels rank after rank to lend support to jihadi armies. It is the time that Muslims are most conscientious in their obedience, and most fervent in their belief concerning Islamic supremacy. Imams stir up the faithful by reminding them that during Ramadan Allah sent the first Muslim armies out for conquest in 623 AD; that he gave Muslims their first huge battle victory at Badr in 624, when they were greatly outnumbered; that in Ramadan 630 Muhammad and his armies marched victoriously into Mecca; and the next year with an army of 30,000 during the ninth month they captured the northern Arabian town of Tabuk. After Muhammad’s death, the Caliph ‘Umar arrived during Ramadan to oversee the surrender of Jerusalem to the forces of Islam. Likewise, during Ramadan 641 the Muslim armies invaded Egypt under ‘Amr ibn al-‘Aas, one of Muhammad’s favorite generals (and one of my putative ancestors).’ It was during the month of Ramadan (644) that Islamic forces conquered the Indus valley; that the conquest of Andalusia began (710); that Muslim forces stopped the advance of the Mongol hordes in the Battle of ‘Ain Jalout (1260); and on and on and on. 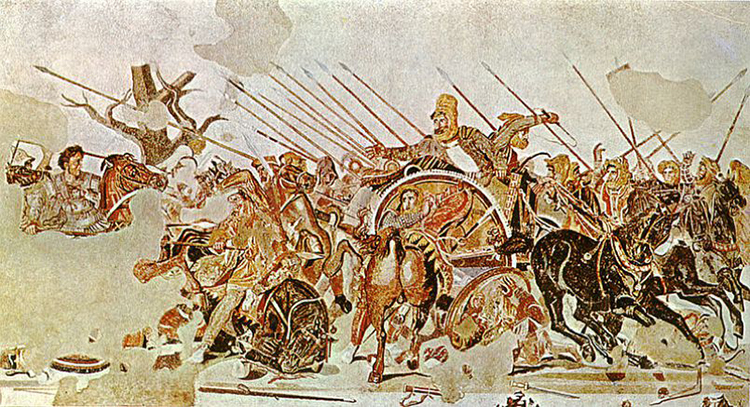 Muslims are proud of their martial history, and understand that while jihad is commanded for all times and seasons, it is particularly “blessed” during the month of Ramadan. So while our presidents and cultural leaders stumble all over themselves to acknowledge “the richness Muslims add to the religious tapestry of American life,” to use the unctuous words of Trump’s speechwriting mandarins, the rest of us need to know the bigger picture as to how the month of Ramadan fits into the overall worldview of Islam. The obedience of Muslims during Ramadan is not limited to the relatively harmless acts of fasting, almsgiving, reading the Qur’an and praying extra prayers. It also includes striving after the greatest deed of all in Islam: to kill or be killed in the cause of Allah. The sharp upswing in violent attacks by devoted Muslims who believe they are doing Allah’s will and that unimaginable sensual rewards await them in Paradise is a sad testament to the conviction that Ramadan is the blessed month of jihad. Would that our political leaders took more notice of this while sipping tea and nibbling dates at iftar dinners…. You GOT it! When I was a Muslim, my zakat only went to the local mosque. Turned out that the mosque we gave to (Lodi, California) was listed on the FBI’s list for supporting terrorist attacks. We did not know where our money went and we never asked. This is something I don’t talk about much, but it is true and many Muslims have no idea what they are supporting. As a Christian, I am set free by the blood of Jesus Christ! There is no more slave nor master. Islam is a hard master. Thank you Mateen! I appreciate you so much! Pam, one slight correction, which explains the reason I did not count the Clinton administration as initiating “iftar dinners.” What Hillary actually promoted were ‘Eid al-Fitr celebrations, which are not part of the Ramadan fast-breaking, but the 3 day holiday period which follows after the end of Ramadan. It is not a huge difference from what Bush and Obama undertook, but it is technically different from the “iftar”, and so I did not report it since I was focused on Obama’s falsehood that Thomas Jefferson hosted the first White House iftar, which continued “sporadically” throughout American presidential history. Thank you, though, for sharing this link. May I repost this on israelnationalnews.com (Arutz Sheva)? You have my permission, with pleasure. Thank you for asking!